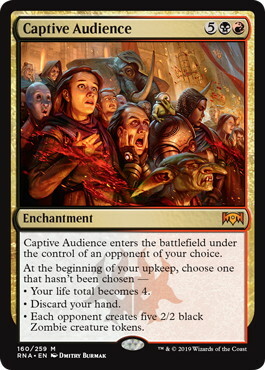 Oracle Captive Audience enters the battlefield under the control of an opponent of your choice. At the beginning of your upkeep, choose one that hasn't been chosen ? ? Your life total becomes 4. ? Discard your hand. ? Each opponent creates five 2/2 black Zombie creature tokens.